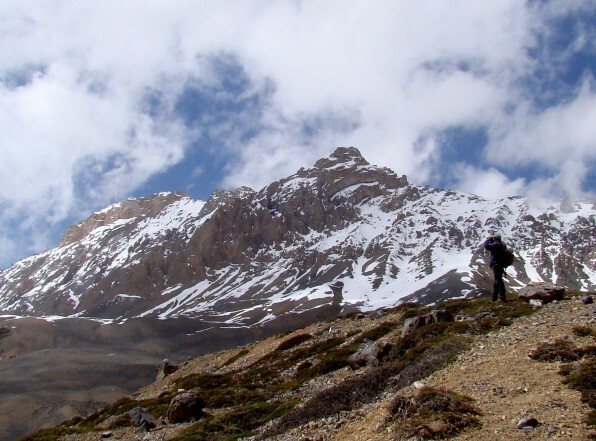 Gya, the highest peak in Himachal Pradesh, a towering 6794 m tall giant, but as elusive as the snow leopard. The peak is hidden so deep in a maze of other smaller mountain peaks that it remained unknown till the late 1980’s. 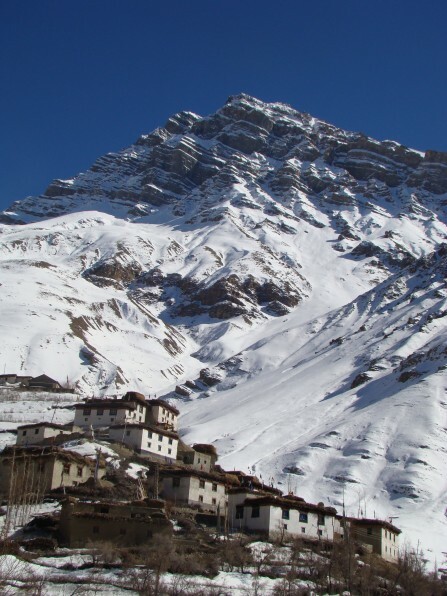 Gya is located at the tri-junction of Himachal (Spiti), Ladakh and Tibet. 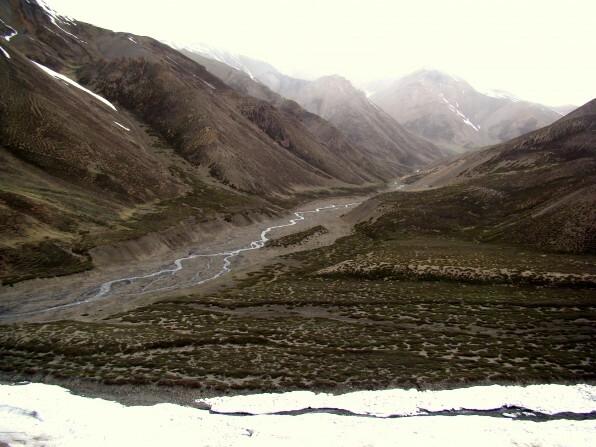 Approaching it from Spiti is an extremely difficult task. Gya sits at head of fortress carved out by the Lingti river. Lingti “an instrument that cuts rocks” as it literally translates from Spitian, has carved a maze of deep gorges, high plateaus and over 20 sentinel peaks rising over an altitude of 6000 m.
Shijibang, one of the sentinels of Gya bears a strong resemblance with the Matterhorn of the Alps. Just that Shijibang is a good 1500m taller! I have been into this maze before. 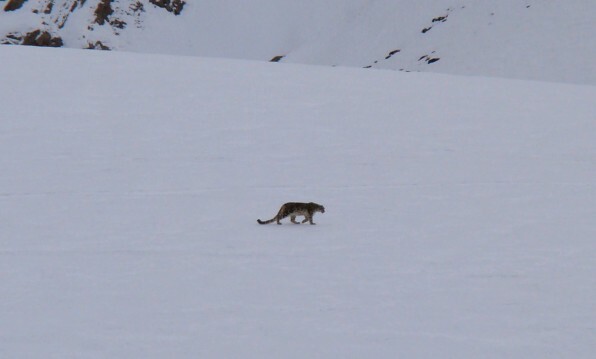 Mainly in search of the snow leopard (Panthera uncia) and the blue sheep (Pseudois nayaur). This time was my forth expedition. 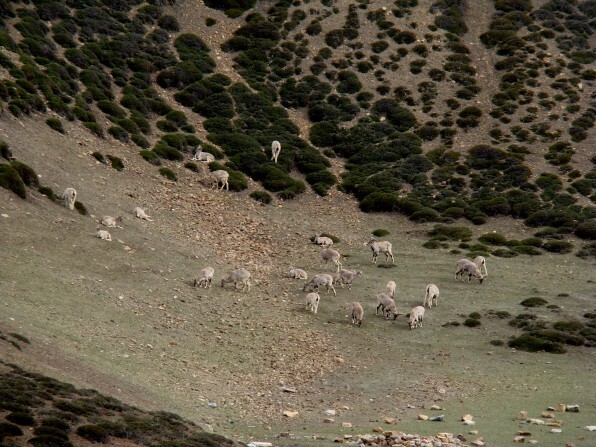 The primary aim was to estimate the population of blue sheep in this region using a new technique called the ‘Double observer survey’. Unlike our previous attempts this time we decided to do the task with a small team of just 5 members. We had to cover an enormous area of about 300 sq km. Most of this has to be approached through high passes and torrent rivers coming from glacier snouts. The expedition began in the village of Lalung. Takpa and I moved to the next camp called Kibri on day one; Chunnit Kesang, Lama and Pandan were to join us the next day with two donkeys loaded with expedition equipment. Day 3 was our first major hurdle of the Shijibang pass (5100 m) a vertical climb of 1300 m from the Kibri camp. Among the many defences of Gya, the first is a row of fairly high but relatively easy peaks such as Kanamo (6974 m), Cho-cho kang nilda (6380 m), Tserip (5890 m), Kawu (5910 m) and Shijibang (c. 5900 m). Across the Shijbang pass (5100 m) we were across the first hurdle. But it also meant that if the weather took a turn we could be caged inside. We camped in Shijibang ‘Grassy medow’. The next day across the pastures of Sheru; we camped here for a few days of field work in this region. This region has a very good density of blue sheep. This is also where we saw our first blue sheep kid born in this year. Our next hurdle was the Lingti river itself. This river is bone freezing cold and has an extremely strong current. But we had a unique solution to this problem. The Yaks! The ship of the cold desert. We were literally going to use them as ships. Yak! The 'ship' of the cold desert! We camp by this river for the next few days at a place called Phiphuk. Our next hurdle was the Kuli pass (4800 m). The climb up to Kuli la is gentle and scenic. 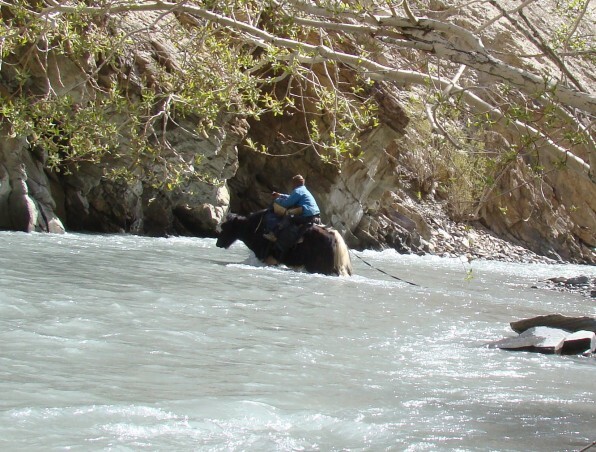 We decided to ride the yaks up to the pass and across to Saktichen. We camped at Saktichen for the next few days. 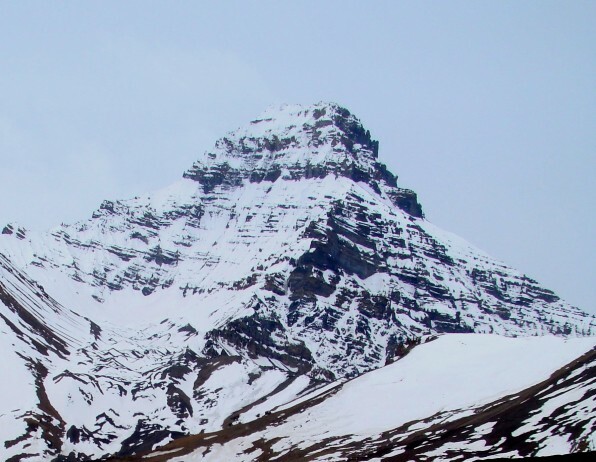 The next defence of Gya is the 5300 m high pass called the Chaksachen la. 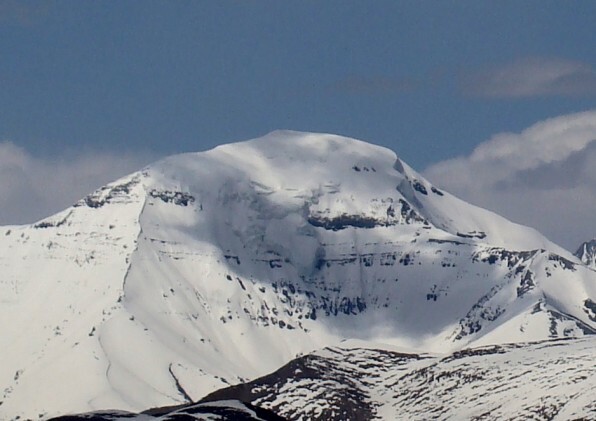 Chaksachen la lies along the ridge formed by Lakhang (6250 m), Shilla (6132 m) and Labrang (5900 m). By now we were low on supplies and we decided that only Pandan and I will go up to chaksachen la and see if there are any more pastures across where there could be more blue sheep. The climb was gentle and we made it to the top without much difficulty. Shree looking for blue sheep; Labrang (5900 m) in the back ground. Across the valley on the other side was the last line of Gya’s defences. 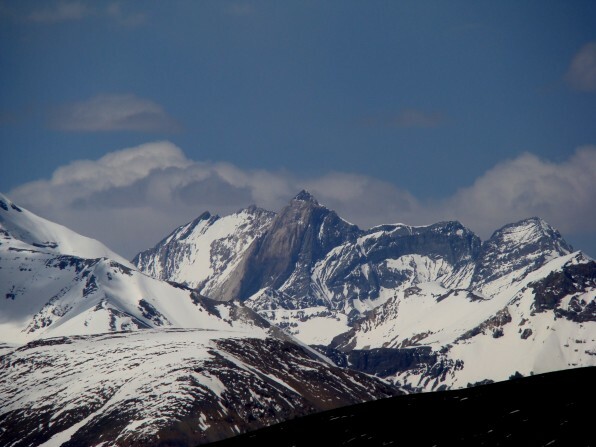 The trio of Geling (6100 m), Runse (6175 m) and Gyaghar (6400 m). The lowest point of this ridge is at 5900 m. Nobody has actually crossed this ridge to reach Gya. Across the Chaksachen pass the gorge was too narrow for any pastures or meadows. We traversed the entire ridge and could not see any more pasture. We decided to wrap up our expedition from here. Gyaghar (6400 m); meaning Indian! On the way back I was a little disappointed. I was going back from my fourth expedition without even being able to see Gya. My last opportunity was the crossing of the Shijibang pass. If the weather remained clear then I had a chance. After seven hours of climbing to the top of Shijibang pass I turned around and there was Gya! From the Himachal side Gya looks like a single monolith rock wall of 1200 m. Getting to the base of this wall is a challenge of itself. Only after this fourth expedition do I feel truly successful. The expedition was scientifically successful as we had achieved the objective of estimating blue sheep abundance in this entire maze. We had been able to see all the animal species present here. And we had managed to penetrate deep enough inside the fortress of Gya to get a sight of the King! Thanks for such awesome Pics. It looks truly amazing. Fascinating! That’s one impressive peak! @ pulicat: Locally the blue sheep is called ‘Nabo’; more generally in hindi they are called ‘Bharal’. Early western explorers probably got carried away with the slight blue tinge of their coat when the sunlight strikes it at a particular angle. Thanks for sharing this adventure! I just wanted to let you know that I’ve included this post in the latest Scientia Pro Publica carnival now up over on my blog. Do drop by when you have a moment.